Twice each year, Amy's Creative Side runs the Blogger's Quilt Festival to coincide with the International Quilt Market, so we can share some of our favorite quilts with those who otherwise might not have seen them in our blog posts. I always find new and inspiring quilters during the festival and love reading about the making of their featured quilt. This year, I knew I wanted to feature Clam Bake. It is my favorite finish to date, of all the quilts I have made so far. It is also the biggest quilt I have made, so I am entering it in the Large Quilt Category. 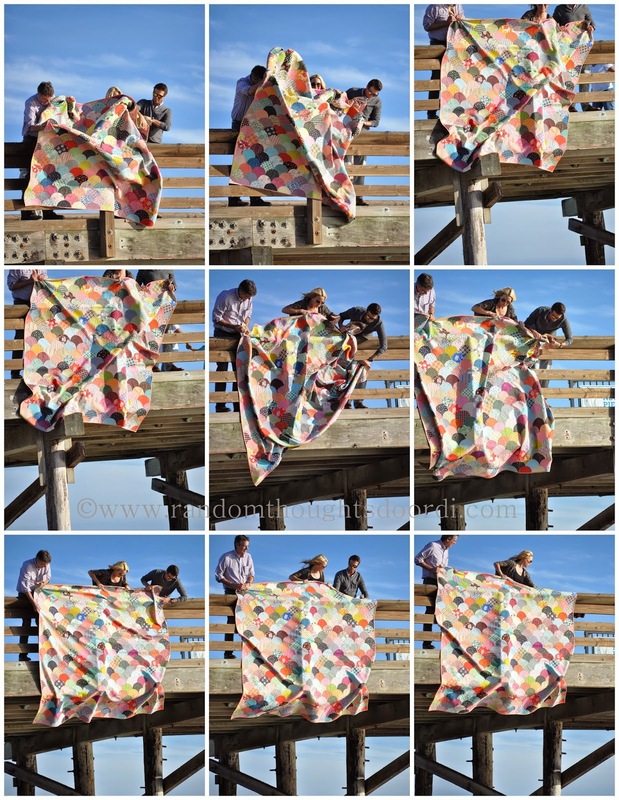 Before celebrating our son's birthday, we stopped at the beach to do a photo shoot of the quilt. My husband, son and daughter-in-law to be were so careful to gently lower the quilt over the railing as I shouted directions from the shore. The wind was blowing quite a bit so I didn't get the shots I had hoped for but I think I still got some really good photos of the quilt. Trying to get the quilt without the tourists was a difficult task, especially because it is Spring Break and the beach was quite crowded. I like that even from afar you can see the beautiful job Natalia Bonner did quilting this beauty. 1. The sun was very bright. 2. The quilt is very heavy. This might be my favorite shot of the quilt which I am now calling Clam Bake. The quilt is so large and heavy. It was a bear to manuever when binding it. It was also quite stiff from being densely quilted and I was worried it would not be very cuddly. It would not fit in my machine at home, I had to take it to the Laundro-Mat. I was so glad when I pulled it out of the dryer and it had softened just like my friends assured me it would. And now that it has been in the sand at the beach I will have to wash it again. I just had to try editing this photo with the Waterlogue app. I think all the colors look so pretty as a water color piece of art. I have always been a fan of Martha Stewart and her talents. I watched her network morning show regularly until her show went to a cable channel. I don't know if she still has a show on TV or not. But anyway...that is where I first heard of Denyse Schmidt and fell in love with her quilt designs and fabrics. Fast forward to about 3 years ago when I became a major fabric collector/hoarder and I started buying different lines of Denyse's fabrics. I have used bits and pieces of them in different projects but for the most part I was saving them for something special. When I first met Latifah she was sewing the binding on her Neon and Neutral Clam Shell quilt and I was instantly smitten and knew I had to make a clam shell quilt of my own. Latifah has a free pattern on Craftsy using templates and also a YouTube video to show you how to sew the curves. These things are all very helpful. I only used the templates for the top row and chose to just square up my quilt after piecing all the rows instead of using her templates for the sides and bottom rows. I was a confident curve sewist before I started this quilt but her idea to sew every other clam shell in a row and then go back and fill in the blanks really makes sewing these rows a breeze. This last Christmas I received the clam die for the Accuquilt and my plan was launched. I cut almost 400 clam shells from nearly 150 different Denyse Schmidt fabrics. I did not use them all in this quilt, so there is still another clam shell project in my future. There is Katie Jump Rope, Flea Market Fancy, Shelburne Falls, Chicopee, Florence, and lots of DS Quilts fabric from Joann's in this quilt. It took me about a month to piece it and then I pondered the backing. I knew I wanted either a flannel or corduroy and when the Paisley corduroy from Chicopee went on sale on Fabric.com I snatched up 10 yards. I really wanted it to be quilted by someone I knew would put a lot of thought into the quilt design and Natalia Bonner was the perfect person to ask. She used five different free motion quilt designs, filling each clam shell and trying not to have two of the same designs next to each other. She did a fabulous job and I am so glad I asked her to quilt this one for me. The binding is also a DS Quilts fabric from Joann's. I really like the orange with all the other fabrics and think it frames it perfectly. This quilt will live on our bed. Now I need to make some pillow cases to compliment it. As a side note, this quilt weighs 9 pounds! This quilt has been "Over-Instagrammed" and has made several appearances on my blog but I have to say, it is my favorite quilt that I have ever made...to date, and I am so glad it is finished. Beautiful quilt. Love the scrappy look of it, and certainly the quilting is amazing. I'll be sure to look for you in instagram. Besides the gorgeous quilt, I’ve never seen such a fun photoshoot! I love this quilt so so much. It has a vintage vibe to it but is thoroughly modern. Amazing quilt. Amazing entry. 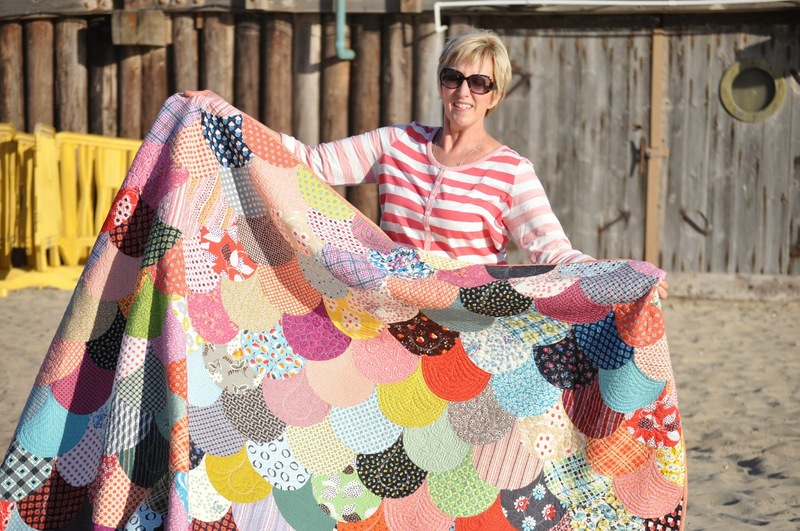 brave quilter - clamshells are not for the faint hearted! it's a lovely quilt and i really like that orange binding. gives it one more zing! at the end. Such a beauty!!!! I remember seeing this on Piece N Quilt & wanting to know more about it. Glad I found it again. 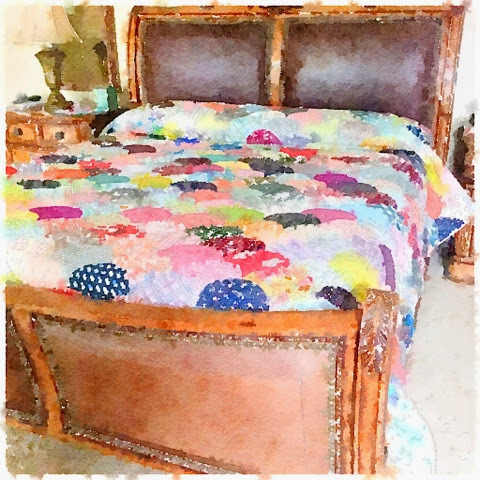 beautiful quilt and photos!! 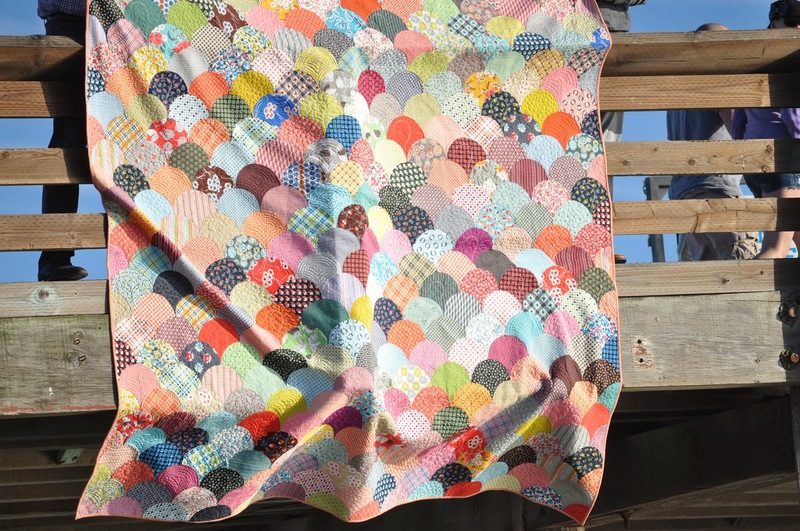 a clamshell quilt is on my quilty bucket list and yours is so inspiring!!! I love the picture on the beach with sand, surf and sky. A perfect location for this quilt! Love this one too! Sooooo much sweat in this quilt! Beautiful!. Your pics are so much fun!. What an awesome clam quilt! 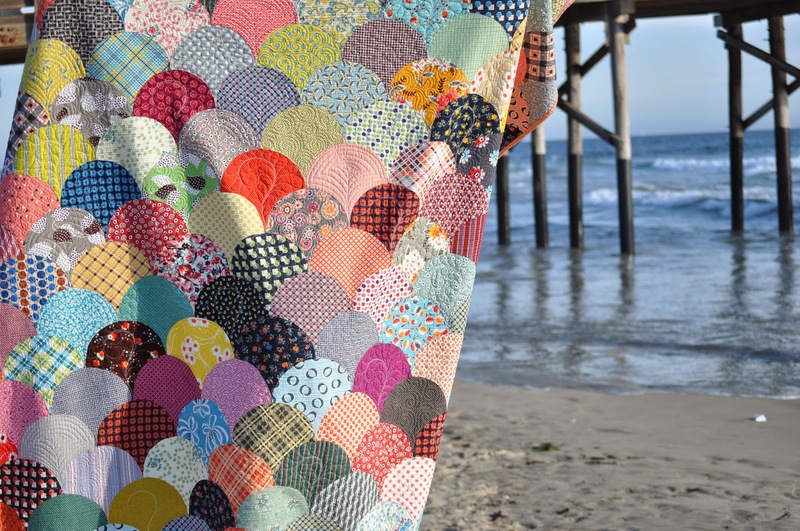 So beautiful and I love to see a quilt at the beach! I think Martha introduced a lot of us to Denyse and man, has that had a huge impact on the quilting world, or what? Love this quilt! Such a beautiful pattern. :) Great pics! Im a HUGE fan of clamshell quilts and this one is a stunning example of how gorgeous they are. That quilting is the bomb! You should be justifiably roud. It's one of the loveliest clamshells I've ever seen! Beautiful quilt! Love your fun beach photos too. It's just beautiful! 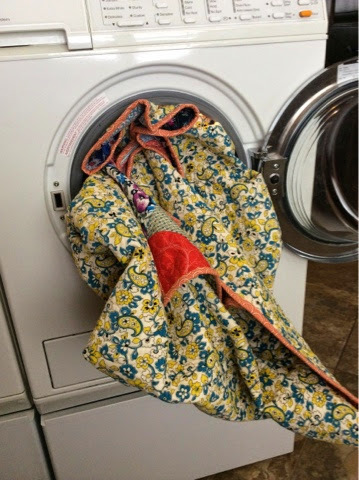 I love the various quilting patterns you did, I bet it was fun to make! Clambake is just beautiful and you've done a great job! I share your love of Waterlogue and find it such fun to transform certain photos into watercolour "paintings". This quilt is stunning! Clam shells are beautiful and this one is just amazing! I love the quilting too! This quilt is just so beautiful! I am a sucker for DS fabrics. 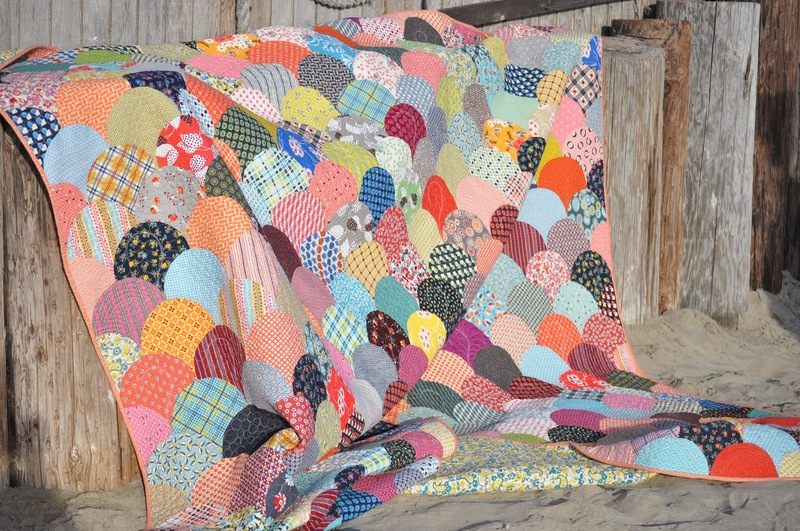 Love this quilt and your pic of the shoot are just great! Congrats!